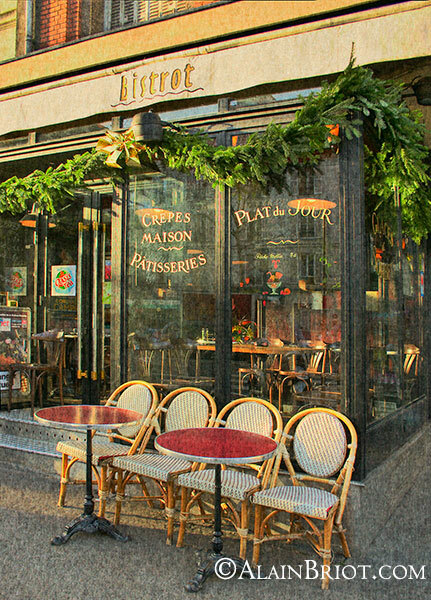 The 167th Alain Briot Print of the Month Collection photograph is titled Paris Bistrot. This photograph is available framed and unframed. It is hand signed on the mat and the print. The print is matted museum-style in a mat hinged to the backing board. The print is attached to the mat with plastic corners, meaning that no tape touches the print. The print is not dry mounted because dry mounting is not reversible. The mounting technique we use is totally archival because the print can be removed from the mat simply by lifting it off. This also means that the print will not wrinkle or warp depending on the humidity level because it has room to expand freely not being attached with tape. This 100% archival mounting is used by museums worldwide and is preferred to all other types of matting and mounting. 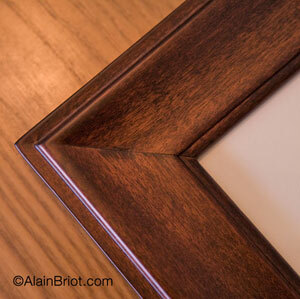 If you order it framed the frame is a handmade Mahogany Finish Frame. The moulding is truly magnificent and does emphasize the beauty of this image. The photograph I took of the moulding show very closely how beautiful this presentation is. However, these pieces looks much better in reality than a web photograph can show! You just won't believe your eyes when you receive yours. All the framing materials used are Museum Quality, archival supplies. All my work is guaranteed for life in regard to fading and damage caused by framing materials. This photograph is priced at my special "print of the month price." Look at my regular prices to see exactly how much you are saving through this incredible offer! For US orders, shipping costs are included in the Print of the Month pricing. US orders are shipped via US Priority Mail insured and trackable. For International orders shipping costs are calculated based on destination. If you live outside of the US you will receive a shipping quote after you place your order. International and overseas orders are shipped via US Airmail insured. Each package is professionally packed and insured by us for its full value. We guarantee that you will receive your matted photograph in perfect condition. If you receive your photograph damaged simply contact us and then return the damaged photograph to us. We will ship you a new piece at no extra cost right away upon receipt of your return piece. a) email your order form. Click here to download your pdf emailable order form, fill in your shipping and credit card information and email it back 24 hours a day. You can also return your order form by mail if you like. b) Call toll free at 800-949-7983 or 928-252-2466 and place your order directly on our toll free hotline using any credit card. c) Order with PayPal by using the Paypal buttons at this Link.